Para mim o caminho Inca foi uma escolha por impulso via um convicted de um casal de amigos. Não Swabia expat amente o que me esperava. O primeiro dia foi um belo passion em um camino de terra com album as rochas laden do o belíssimo Rio Urubamba. As paisagens exam fantásticas e a caminhada foi agradável. Minha experiencia na trilha inca foi muito boa. Meu objetivo era de desenvolver a paciencia e a calma, paois para mim isso e o mais dificil. Comviver com pessoas diferentes e aprender a ser mais tranquila. Meu primeiro dia foi de surpresa, estava bem mas vi que precisava ter um melhor desempenho fisico. Thank you very much for amazing four days. 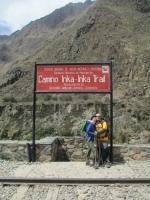 I had a great time hiking the Inka Trail, even though it was hard at some points as the Dead Woman's Pass. 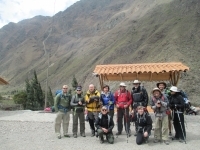 The service including the porters, the food as well as the guides was truly outstanding and I did not miss anything during that time. So hatte ich mir meinen Urlaub nicht vorgestellt! Erholung sollte es sein, eine schoene und gemuetliche Zeit wollte ich mir machen. Nix da. 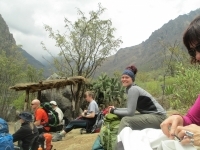 Meine Freundin Dagmar hat mir einen dicken Strich durch die Rechnung gemacht und uns auf dem Inka Trail eingebucht! Nature as it is best with the coolest guide ever, funny stories, history stories, real stories , relaxed rhythm and great ad-hoc group ! 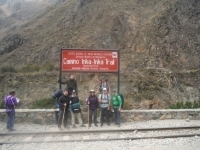 Sooo happy to have had the privilege to walk on Inca Trail and in this formula ! Att vandra i Peru, en upplevelse utan motsvarighet, ett minne utan like. Inkaleden som jag har lyckats att vandra tillsammans med en underbar grupp ledda av trygga och mycket erfarna guider. Har nu en kunskap om det gamla Inkariket men det finns mer kunskap att ta till sig. I am fortunate enough to have traveled to many parts of the world including Nepal, Angor Wat in Cambodia, the temples of the Yucatan Peninsular, safari in Africa and all of the major cities of Europe. 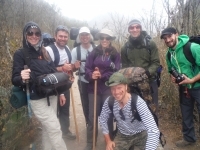 Walking the Inca Trail to Machu Picchu just surpassed all of these experiences. 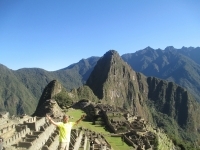 If your heart has succumbed to cynicism, if you think that the world has no real mystery or adventure, then you owe your soul a trek along the Inca Trail to the wondrous city of Machu Picchu. Your perceptions, preconceptions, and assumptions will be turned on their head. 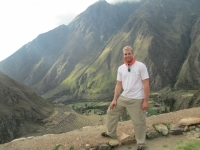 My Inca Trail experience far superseded my expectations. 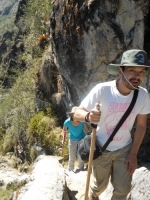 From day 1 our guide Paul was absolutely amazing at explaining the history of Incas as well as showing us how to pace ourselves for maximum enjoyment of this great historic trail while explaining the land and landmarks which are important to the ancient civilization. 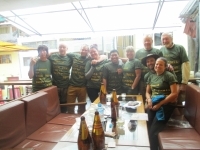 I signed up with Inca Trail Reservations based upon the recommendation of a friend's friend and I have not been disappointed in any aspect of the trek of the Inca Trail or the arrangements Mariella and Mabel made for the Galapagos Islands next week. But, I will focus on critiquing the past week. This was by far the hardest hike I have ever done, but it was also one of the most life changing. 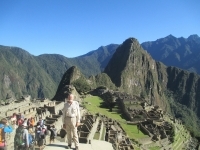 Machu Picchu and the Inca Trail are so beautiful but what made this experience even better was our tour guides Paul and Hilton. From start to finish this trip has been life changing. Being immersed in the vegetation, culture, people, smells and sounds of the trail and life within it has truly changed my life. Our tour guides shared stories of Inca history and personal experience that left us completely captivated and constantly entertained. This trip was everything we could have hoped for and so much more. From the time we made the reservation the staff answered any and all questions we had and provided recommendations that made our adventure that much more enjoyable.